At first I was skeptical about getting this CD. I wasn't sure about how I felt about Bridgit going solo but then again she was never in a "band" but she was with the group Lemonade Mouth for the movie. I heard her song and saw bits of the music video for "Ready or Not" and the song slowly grew on me. What made me break down to buy it was what she had to say about making the album and how she got the title for it. 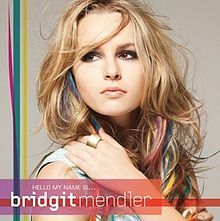 She thought that "Hello My Name Is.." Was a great way to introduce her first studio album. The music is pretty mature and I was surprised it wasn't like Hilary Duff's first album from when she was under Disney. The lyrics seems genuine. If you're a couple of college girls that just want to drive around and have a good time, this album might as well be one of the many you play as you drive. My first favorite song on here is "City Lights" just for the fact it fits my personal life situation perfectly. In short the song is saying that no matter how hard things become and how dark the things may seem you and you're "city lights" will shine through the night and pave the way to where you're suppose to go. My second favorite song is on the Deluxe Edition of her CD. The song is called "Postcard." This song is for all the people who believe that because someone does something different and unique it's not "suitable" for them. The song refers to gender but dig deeper and it goes farther than that. It's stating that just because you do not think I can do it doesn't mean I can't. My third favorite song will be "5:15." In my personal opinion I think this is a good song because it's stating that she'll wait until 5:15 to declare his love to her but if he does not then she's leaving because she won't let someone hold her back from her dreams and will continue to search for the one while on tour. This is my personal interpretation of the song. If I were to suggest which album to get of hers, I suggest you to get the deluxe edition. Personally, the last 3 songs on the deluxe edition compliment her first release even more. One thing refreshing about this album especially is that if you look at all the contributors to the lyrics, you will see that her name is in the line up. It's not often this happens. Yes, some artist do write their own lyrics and their own songs but this was nice because you can really understand her story behind all the lyrics. I have to say I honestly thought I would be disappointed but I was completely blown away. I give this album a 8 out of 10. I say an eight because while I do love her powerful strong voice and the reggae pop rock fusion, I was still hoping for more of just a pop rock sound but then it also may be because I have only heard her from Lemonade Mouth and never expected the reggae fusion. I have to say though that I do love this twist in genre because it's something new and it's something that she does quite well. I have to say that her voice compliments this pop rock reggae fusion genre really well. Otherwise I love this album and again suggest you buy the deluxe edition versus the regular.